One of the most interesting witnesses for the prosecution must surely have been young Eli Bence, the pharmacy clerk who testified that Lizzie Borden had asked for a dime’s worth of deadly Prussic acid on the morning before the murders. Mr. Bence denied her request without a prescription, but remembered her face and voice, and would later identify Lizzie, as did two other men in the store at the time, as the lady who visited the store that Wednesday morning. Bence’s evidence was a godsend to the prosecution and stood firm until it reached the higher court. There it was ruled too remote in time from the killings -and no poison was ever found in the stomachs of the two victims. Eli’s evidence, had it been heard by the jury, may have had serious consequences. Miss Borden denied going to the pharmacy and even knowing where it was located on Main Street, only two blocks south of her house. 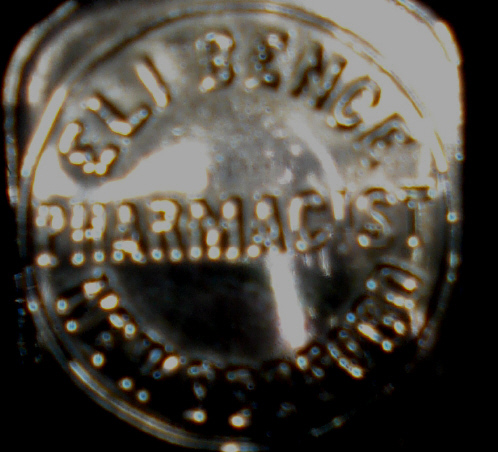 Bence left Fall River and started his own pharmacy in a residential section of New Bedford in 1894 at the corner of Russell and Fourth Streets. His wife died in New Bedford, but Bence remarried in 1904, to a Fairhaven woman, and the pair with his young son Roy Sydney Bence, moved to Pittsfield, Massachusetts to establish another pharmacy. The couple had two children, Priscilla and Maxfield. Bence had a successful career and rose to the top of his profession. His name in print was always followed by a mention about the part he played in the famous Borden trial, even in his obituary. 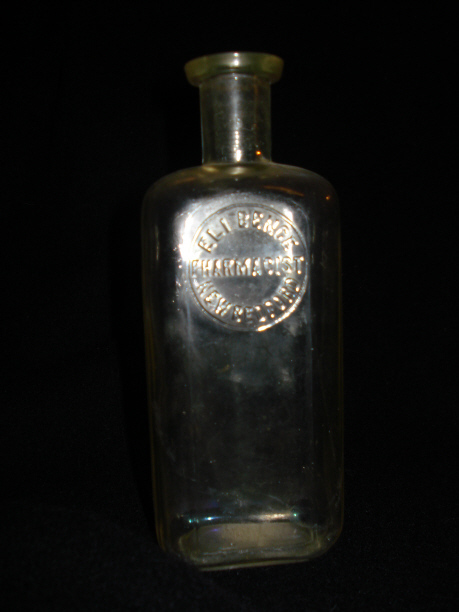 This medicine bottle, minus its cork stopper was recently found in a New Bedford antique store and reads Eli Bence Pharmacy, New Bedford. You bet it is my prize! I have always been a great believer in Alice Russell and Eli Bence. Lizzie got lucky that their testimonies about the pharmacy visit and the burned dress did not make it to the final leg of the deliberations by a jury. Bence and Russell were both credible witnesses with incriminating evidence to disclose. Very cool! Is this now your prize? If so, great find. Congrats and a great post!